Run time: 2 hr. 55 min. 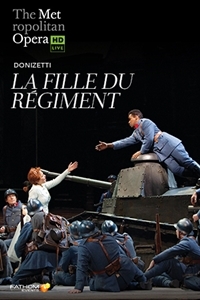 Synopsis: Fathom Events and the Metropolitan Opera present a broadcast of Donzietti's La Fille du Régiment, live in select cinemas nationwide on Saturday, March 2. Bel canto stars Pretty Yende and Javier Camarena team up for a feast of vocal fireworks on the Met stage. Maurizio Muraro is Sergeant Sulplice, with Stephanie Blythe as the outlandish Marquise of Berkenfield. Enrique Mazzola conducts.